This entry was posted in Uncategorized on November 10, 2018 by Jackie Andrade. Our trial of FIT for weight loss has been published in the International Journal of Obesity. Participants who received FIT loss 5 times as much weight as those who received an active control group. This finding has generated a lot of media interest. You can read the University of Plymouth press release here. We are endeavouring to reply to everyone who has enquired about FIT but in the meantime, please read our answers to Functional Imagery Training FAQs. This entry was posted in Uncategorized on October 3, 2018 by Jackie Andrade. Are you interested in using FIT to motivate your clients? We shall be running a two-day CPD workshop 22-23rd March aimed at healthcare practitioners including psychologists, physiotherapists, dieticians, fitness and lifestyle coaches, and others working to help individuals to change their behaviour. Please follow this link to sign up or contact jackie.andrade@plymouth.ac.uk for more information. This entry was posted in Uncategorized on March 1, 2018 by Jackie Andrade. 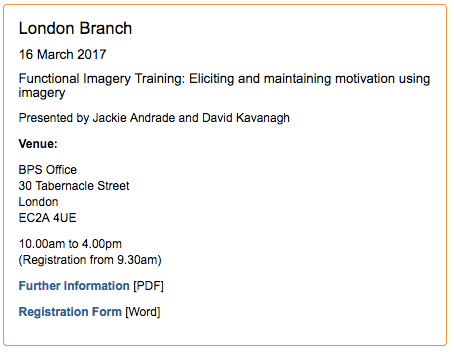 On Thursday 16th March, David Kavanagh (QUT, Brisbane) and I will be in London to deliver a FIT workshop for the London branch of the British Association for Cognitive and Behavioural Psychotherapies. This entry was posted in Uncategorized on February 27, 2017 by Jackie Andrade. Functional Imagery Training is an important element in a new therapy for people with multiple sclerosis. The BRiMS (Balance Right in Multiple Sclerosis) programme combines exercise and education to reduce falls and improve quality of life. FIT is woven throughout the 13-week programme to help keep people motivated. Project leads Jennifer Freeman and Hilary Gunn have been awarded £367k by NIHR for a feasibility study of BRiMS. Jackie Andrade is the psychologist on the project, responsible for incorporating elements of FIT into the participants’ and therapists’ manuals and creating brief motivational audios for the BRiMS website. You can read the full press release for the project here and follow the project on Twitter @BRIMSproject. This entry was posted in Uncategorized on September 27, 2016 by Jackie Andrade.